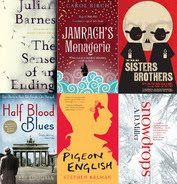 The Booker Prize shortlist has been announced! A very interesting list, including four of the six titles I predicted last night. I read the first fifty pages of Pigeon English in a Barnes & Noble while killing a bit of time before meeting friends, and I truly doubt this one will win. It seems Pigeon English is this year's Room, a creatively narrated story but not much more. So thrilled to see Jamrach's up there! Whether or not it wins, I hope more people read this one. Damn, you just about nailed it. I know, right? From what I've read on other sites (especially the Booker 'Debate' message board), a lot of people are pretty unhappy with the shortlist... but I'm pretty excited about it. I've not read the DeWitt yet, but to see Jamrach's and Sisters Brothers up there says to me that things are changing and people are being more accepting of crazy, almost pulpy literary romps. But, then again, maybe the "best of the year" award isn't the place for that. What do you think?